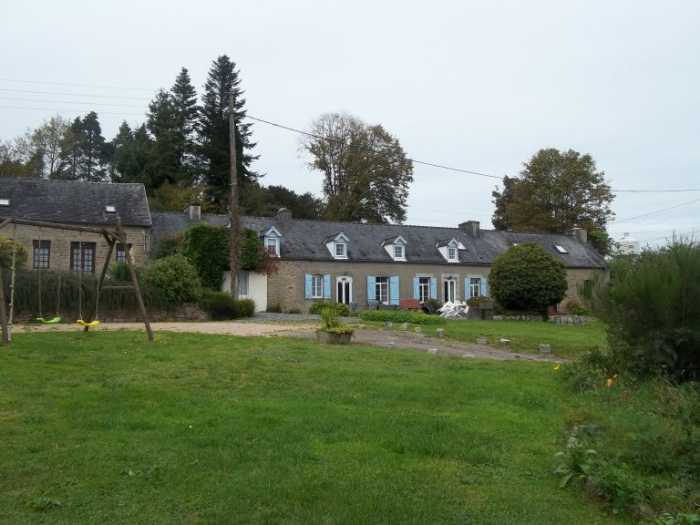 Properties for sale in Brittany, France - AHIB-3-M2018-2914859 Huelgoat 29690 Great potential: main house, 5 gites, swimming pool, 2.5 hectares of land, and outbuildings in Huelgoat! AHIB-3-M2018-2914859 Huelgoat 29690 Great potential: main house, 5 gites, swimming pool, 2.5 hectares of land, and outbuildings in Huelgoat! This property is located walking distance from the centre of the village of Huelgoat, in a very quiet environment. It is a fabulous property for the ones who want to run a complex of gites with the possibility of having horses or other animals. The gites are ready to be rented, some improvements will be needed, nothing major but some modernization and upgrading. There is the main house which is presently a 2 bedroom house but could be made bigger for a large family if you use the gite attached which has 3 bedrooms, so it would be a 4/5 bedroom main house and 4 gites to rent. The gites have between two bedrooms and 4 bedrooms, some with one bathroom and some with 2 bathrooms. They have fireplaces, wood burners, beams, all with fitted kitchens, they are quite spacious, facing the front garden, each one with a terrace area and lovely views. SAVE 15% OFF YOUR BRITTANY FERRIES CROSSING when you view with A House in Brittany/Normandy...We'll send you a discount booking code for your ferry crossing when you have confirmed your appointment to view. In the front garden is a good-sized swimming pool, ideal to attract the families in the summer. Very large garden in the front overlooking a fantastic view, plenty of space for the children to play safely. In the back is the 2.5 hectares field which is perfect for horses, all the land is flat. There are also some outbuildings which need some renovation work, attached to the main house in the back is a large workshop and a car port. There are two entrances to the property and plenty of parking space for several cars. All the stone houses are in a general good condition, it is a nice looking property. Huelgoat is a touristic village which offers all the shops, cafés, restaurants, lake and forest. This property offers a good potential to develop and the location is perfect!